Blackcurrants are an important crop in Burgundy, and essential for a kir! Blackcurrants (cassis, pronounced "kah-SEES") grow abundantly in Burgundy, thriving in the same soil and temperatures conditions as the region's famous wines. Harvested in the summer, these small dark-colored berries are used in a variety of products, from cassis jam to sorbet to pastries to candy. It's also used in savory dishes, such as in a sauce for duck. But its most famous use is in crème de cassis, a liqueur used to make the famous apéritif Kir, a combination of crème de cassis and white wine. Traditionally a Burgundy Aligoté wine was used, though these days it may be made with any dry white wine. The Kir has been around since the mid 1800s, and for much of its life was called simply a "blanc-cassis," or "vin blanc cassis"—white wine and cassis. In the mid 1940s Dijon elected Félix Kir as Mayor, a post he held until his death in 1968. He also represented Dijon in the National Assembly for many years. A priest by training, he was a resistance fighter during World War II and later entered politics. Mayor Kir made it a practice to serve vin blanc cassis to visiting delegations from across France and around the world. This was done to promote Burgundy and its products—wine and cassis. Over the years the drink became associated with the Mayor, and eventually he gave his name to it. When I first visited Dijon in 1968, Kir was popular there. But in Paris and other parts of France the name was not widely used, and you had to ask for a vin blanc cassis. Today it's become so popular that if you order a Kir outside of Burgundy, you're likely to be asked, "Quel parfum?" or "what flavor?" 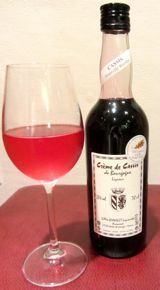 You might be offered peach (pêche) or mûre (blackberry), but to my mind a real Kir is only made with crème de cassis! There's also the Kir Royal, made with Champagne or Crémant de Bourgogne, the local sparkling wine. Kir Pétillant is the name sometimes used for Kirs made with other sparkling wines. A Kir Pétillant may be less expensive than a Kir Royal in some places (though it may not always be offered as as option). In Normandy you can get a Kir Normand, made with crème de cassis and Normandy cider; in Brittany you can get the same drink, called a Kir Breton and made with Brittany cider. You'll also occasionally see a Communard on the menu, which is a Kir made with red wine. The original drink was apparently made this way, but when Mayor Kir took over there was a lack of red wine after World War II, so he promoted the white wine version. It's easy to enjoy a Kir at home. You can buy crème de cassis in shops in Dijon, or get some once you're home. If you can't find crème de cassis at your local store, they can usually order it for you. Proportions vary with taste, and crème de cassis is quite sweet. Start with about a 1:5 ratio of cassis to dry white wine (or Champagne), and adjust to suit your preference. By the way, when you're in Dijon you might also want to visit Lac Kir, a lake northwest of the center of town also named for the Mayor. 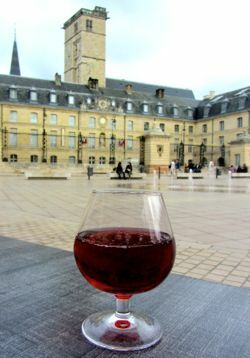 Above, Enjoying a Kir in the Place de la Libération, Dijon, with the Tour Philippe Le Bon and the Palais des Ducs de Bourgogne in the background. 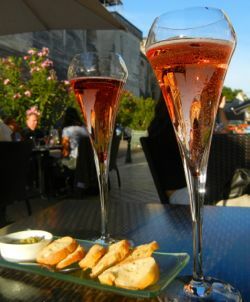 Below, Kir Royal in Amboise, at the foot of the Château d'Amboise. 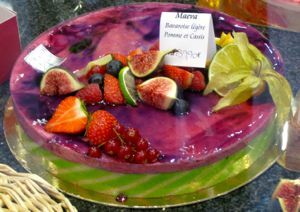 Above, A lucious looking bavaroise (Bavarian cream) dessert topped with cassis.